(Newser) – A new study suggests that heavy drinking raises a person's risk for dementia, especially the early-onset variety. The research, published in Lancet Public Health, looked at 1.1 million French hospital patients diagnosed with dementia from 2008 to 2013. Of those patients, 16.5% of the men and 4% of the women had alcohol use disorders, which CNN reports is about twice the rate of those without dementia. The stats for early-onset dementia were worse. Of 57,000 cases, 38% were "alcohol related by definition" and another 18% featured an additional diagnosis of alcohol use disorder, per the Guardian. The bottom line? "Alcohol use disorders were a major risk factor for onset of all types of dementia, and especially early-onset dementia" per the study. 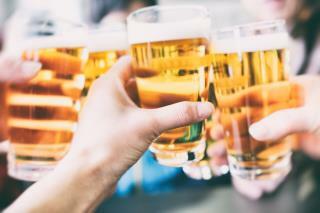 "Thus, screening for heavy drinking should be part of regular medical care." Life is too short so enjoy yourself people! Dementia is not necessary a bad condition, to lose fear of death. This is news? We've known about pickled brains for centuries.